The fact that Tate Modern is by far the most visited modern art gallery in the world shows what a vital role the British capital plays on the global contemporary art scene. London's creative credentials are second to none - a gaggle of the world's best-known artists live here and the city is also home to some of the most cutting-edge commercial galleries to be found anywhere. In addition, the captial is home to the big three auction houses, which can make or break a living artists' careers with the thwack of an auctioneer's gavel. 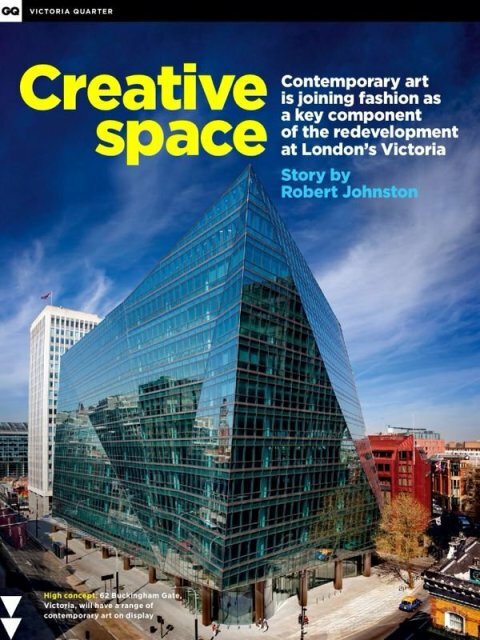 Perhaps the most contemporary-focused of the three is Philips, whose London headquaters is based on Howick Place at the heart of Victoria's burgeoning creative quater - close neighbours include Tom Ford and Jimmy Choo. Likewise, developer Land Securities is putting art at the heart of its ambitious plans to turn Victoria into the capital's most vibrant and inspiring neighbourhood, investing in works by the likes of Conrad Shawcross and Rob and Nick Carter for its buildings. For example, 62 Buckingham Gate, one of Land Securities' flagship developments, is home to an impressive array of contemporary art, including tapestry by Turner Prize-winner Grayson Perry, and the building's entrance has become a 42m-long showcase for new artworks. Initially better known for his works in ceramic, in 2009 Perry revealed he was just as talented in textiles when he showed the "Walthamstow Tapestry" at the Victoria Miro Gallery. For 62 Buckingham Gate, Land Securities has aquired new work entitled "The Annunciation of the Virgin Deal", creating one of the country's most dramatic reception areas. But then the area has been no stranger to the arts over history. The Great West Door of the magnificent Westminster Abbey faces up Victoria Street, and is testament to British architectural genius, with additions such as the towers by Nicholas Hawkesmoor and work by George Gilbert Scott complementing the achievements of the stonemasons whose names have been lost to history. Westminster Cathedral is the outstanding work of the Neo-Byzantine style, which Jacob Epstein's "Day" and "Night" can be seen high above 55 Broadway. The masterpeices of tomorrow can also be found in Victoria, thanks to Edel Assanti Project Space, a new gallery on Vauxhall Bridge Road, the brainchild of Charlie Fellowes and Jeremy Epstein (no relation). The duo managed to talk Westminster City COuncil into helping them with a hige gallery space just ten minutes' walk from Tate Britain. The prices start at £700, so it's accessible for the mascent collector. So whether you want to buy or simple wander and wonder head down to SW1 and have an art attack.